Kidd-O Zone Enhanced Program at Grand Oasis Palm!! Day or Night, the Fun Never Ends! Family time. Me time. Time for Romance. You can have it all at Grand Oasis Palm. 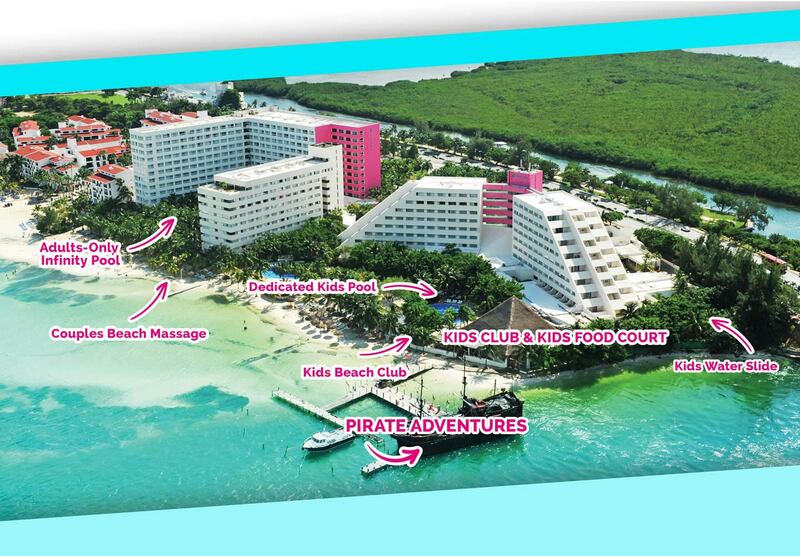 Oasis Hotels and Resorts has just introduced the brand New Kidds – O –Zone program at Grand Oasis Palm! There are so many exciting activities for kids to enjoy, from arts and crafts, splash zone, gaming room, as well as an opportunity to test their culinary skills. Because the program is open from 9AM to 10PM and the hotel has special areas for kids and adults (see map below) parents can enjoy some alone time as well from golfing to a romantic dinner at the Adults Only restaurants. The Grand Oasis Palm is All-Inclusive...All food and drinks are included plus aerobics, beach volleyball, tennis, activities organized by our professional entertainment team, and our house shows. You even get a fully stocked mini-bar and room service. Want more? Kids stay play and eat FREE! (Terms and conditions apply*).